Vintage is one of the easiest baby nursery decorating styles to use, as well as, one of the least expensive. Although the vintage nursery style represents the era of the 1940's and 1950's, it has really come to encompass any look that is old, traditional and classic. The use of old family heirlooms and antiques such as vintage baby carriages and antique dollhouses ensures that this nursery decorating style brings back memories of a simpler, safer time. The vintage nursery decor style is a wonderful option for nursery decorating if you love to collect old flea market treasures and rare antique finds. Your home is probably brimming with all sorts of knick knacks that are just waiting to be given pride of place in a beautiful vintage nursery! 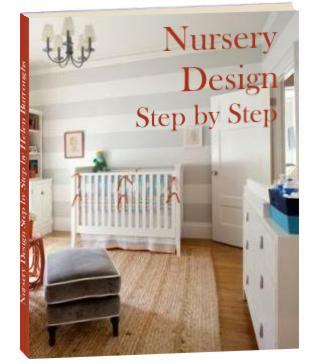 Ready To Start Your Nursery Decorating? First you'll need some beautiful vintage nursery bedding to start you off. Toile crib bedding sets look gorgeous in a vintage setting. Everything from blues and chocolate browns to pinks and whites; vintage circus to old world nursery rhyme. Choose two or three muted or pastel tones for your baby nursery colors. Any color will work as long as it isn't too bright. Stick to this color palette for your nursery bedding, walls, window treatments and rug. A consistent color palette running through your main nursery decor elements will keep your nursery design in harmony allowing you to add almost any vintage accessories that you have squirreled away. 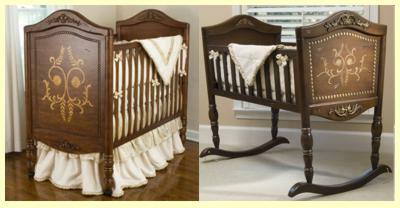 When you choose your nursery furniture pieces, you should be thinking old and worn. Anything from antiques and heirlooms to simple refurbished items. Look around on eBay and Craigslist, as well as, at local yard sales and charity stores for something adorable that catches your eye. If you can't find a suitable vintage baby crib for your little one, the Old World Crib and Cradle by Green Frog Art is an option. The cradle is available at Amazon.com, while you can buy the old world crib at Babyearth.com. Use pretty, patterned fabrics. Toile and floral crib bedding sets are a perfect match for vintage nursery decor. Make sure to use lots of layering in your vintage nursery fabrics, mixing and matching different textures and patterns. Lots of slip covers, throws, lace and crochets give a nostalgic feel to the room. Don't forget to look out for a handmade patchwork quilt to include too. (Maybe you need to twist the arm of an aunt or mom-in-law?) Patchwork quilts make lovely wall hangings in a vintage nursery. You can base your baby nursery design around one special item like an antique baby cradle or doll's house. Make it the focal point of your nursery. If you have a collection of vintage toys you can base a vintage nursery theme around them by displaying them on open shelves or glass fronted display cabinets. Vintage circus, nautical and cowboy baby room themes are popular choices but you can incorporate almost any antique toy collection. If you don't have a collection but this idea appeals to you, start collecting now and add as you go. Scour the antique stalls and vintage flea markets to see what you can find. If you have lots of knick knacks to add to your vintage nursery decor then a wall collection is a good idea. You can include anything from baby rattles to pretty ceramics and old family photos. Use shelves, frames and shadow boxes to arrange your collection in a pleasing display. Or use vintage alphabet cards as a base for decorating a baby nursery in a vintage style. Alternatively, you can create a grouping around a small table or shelf or set up a painters tray. Here are some gorgeous vintage nursery clocks I found to get you started. Choose from table clocks or wall clocks for your baby room. I hope this page has inspired you to create a baby room using vintage nursery decor! For more inspiration don't miss the gallery of vintage nursery decor pictures!